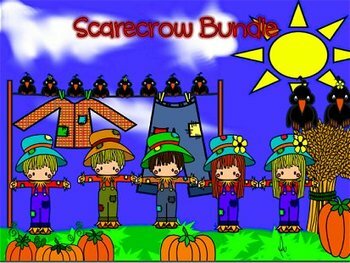 Scarecrow Thanksgiving Bundle includes a total of 15 images. All images are transparent in PNG format. All images a lot bigger than they appear in preview. Download preview under image. It is in a PDF file so you can see them better. **Boy scarecrow with bright blue overalls, red shirt, reddish hair, blue hat with a brown stripe in hat. 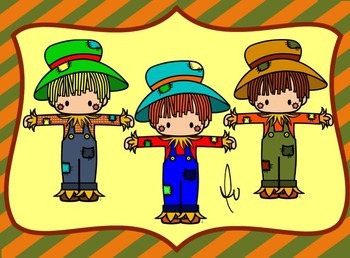 **Boy scarecrow with jean overalls, plaid shirt, blond hair, green hat with orange stripe. **Boy scarecrow in fall colors (like the one on preview) , reddish hair. Light brown hat with dark brown stripe. 1 line of clothes that has several crows resting on it . There is a plaid shirt and a jean hanging from it.